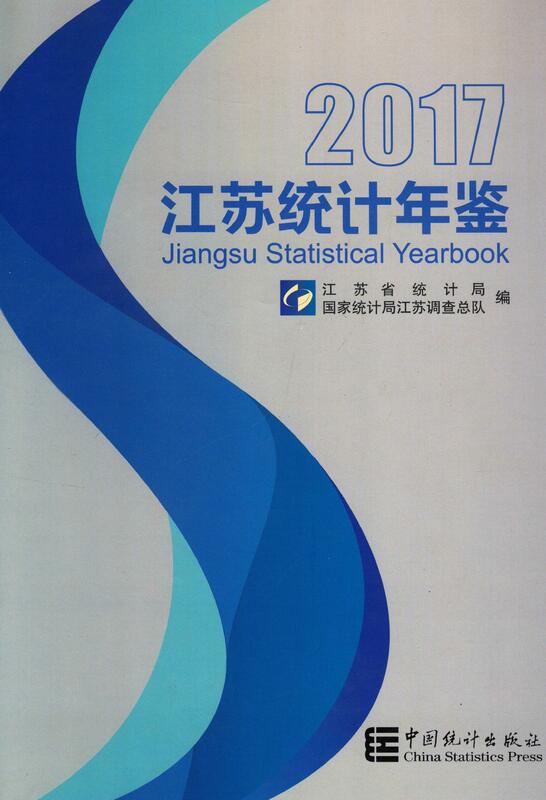 Ⅰ.Jiangsu Statistical Yearbook 2017(abbreviated as Yearbook hereafter) is an annual publication which provides comprehenisive and systematic data series about the national economy and social development in Jiangsu Province in 2016 and some selected data series in historically important years.It includes much statistical information on social and economic development in the province and in various regions. Ⅱ.The Yearbook contatins the following twenty-one parts:1.General Survey,2.National Accounts,3.Population,Employment and Wages,4.Price Indices,5.People's Living Conditions,6.Investment in Fixed Assets,7.Government Finance,Financial Intermediation,8.Foreign Trade and Economic Cooperation,9.Energy,Resource and Environment,10.Agriculture,11.Industry,12.Construction,13.Transport,Postal and Telecommunication Services,Service Industry,14.Wholesale and Retail Trade,Hotels,Catering Services and Tourism,15.Science and Technology,Education,16.Culture,Sports and Public Health,17.Public Management,Social Security and Social Organizations,18.Urban Economy and Construction,19.Regional Economy,20.Social Economy of Cities and Counties,21.Social Economy Development Alignment of Counties(Cities),Appendix,Major Indicators by Region.To facilitate readers,the Brief Introduction at the beginning of each chapter provides a summary of the main contents of the chapter,data sources,statistical scope,statistical methods and historical changes.At the end of each chapter,Explanatory Notes on Main Statistical Indicators are included. Ⅲ.The major data sources of this publication are obtained from annual statistical reports,and some from sample surveys.National major indicators grouped by provinces are obtained from relative statistical data published by the National Bureau of Statistics of China. Ⅳ.The units of measurement used in the Yearbook are all internationally standard measurement units. Ⅴ.The classification of national economic industry used in the Yearbook is the national standard of 2011's "The Classification on National Economic Industry",i.e.(GB/T4754-2011). Ⅵ.The price used for gross indicator's calculating are current prise. Ⅶ.Statistical dicrepancies due to rouding are not adjusted. Ⅷ.In the Yearbook,"…" indicates that the figure is not large enough to be measured with the samllest unit in the table;(blank)indicates that the figure is not available,"#" indicates the major component items. We express thanks to the general readers of domestic and abroad for supporting and helping the work of compilcation and publication of the Yearbook.We sincerely welcome conitinued valuable suggestions from the general readers so that the form and content of the Yearbook can be further improved.